Posted by Sherri & filed under Client Media Coverage. 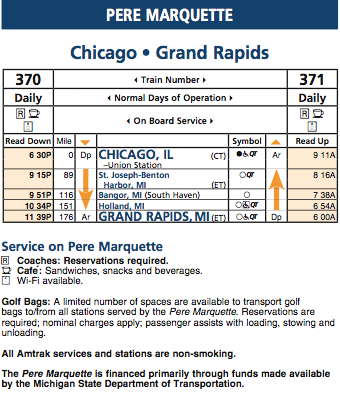 A new schedule for the Amtrak Pere Marquette will make it more convenient for passengers to attend sports, music and theatre events in Chicago and result in eight to 10 jobs being based in Grand Rapids, Michigan, effective May 4. 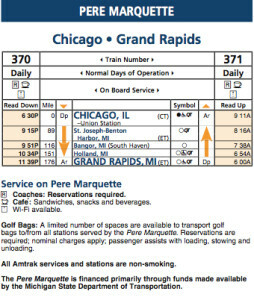 The new schedule also improves connections with other Amtrak trains. The current schedule allows a six-hour day in Chicago and was crafted for Chicago-based crew cycles. 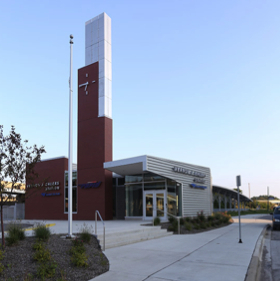 Last year’s opening of the Vernon J. Ehlers Station allowed for the creation of a crew base in downtown Grand Rapids and a nine-hour day for passengers to work or play in Chicago. Amtrak employed 237 Michigan residents last year, with total wages of $19.5 million. Goods and services purchased in Michigan by Amtrak totaled $17.3 million in 2014. All Amtrak service in Michigan is operated under a contract with the Michigan Department of Transportation (MDOT).